Man caves are a great addition to any home. It is a separate room for the man of the house to have his own space for him and his friends to relax and unwind. One of the most important features you will need when building your man cave is the home bar . A man cave is just not complete without a man cave bar! With so many different style bars out there to choose from or build, it can be difficult to determine which bar is right for you. The biggest decision concerning setting up a bar for a man cave is whether or not you want it custom built or purchase one already made. A custom built bar can be time consuming and expensive. Whereas a ready made bar will have you serving bear and cocktails in no time. Amazon.com offers great home bars that are ready to go. This article will explain the differences in bars, features, lighting, setting it up, and providing plenty of man cave bar ideas. Choosing the type of bar you want may be the hardest part of building your man cave. There are many types of bars and styles to choose from which can all depend on your budget. You can either have a custom made bar built right into your home or purchase a portable bar that can be easily moved if necessary. There are five basic types of bars to choose from. The first type of bar is your basic straight bar that should cover the entire width of the room. The second type of bar is the back bar. This bar is more ideal for display or if your man cave is on the small side. There is no counter area for friends to sit and it is mostly shelving against a back wall that you can fill with alcohol and glasses. The third type of bar is the L shape which is the most common and classiest option to choose for a great manly space. The L shape bar has plenty of room for guests to sit and relax. It also has space for you to mix up those specialty cocktails you love to serve your friends and family. The fourth type of bar, is the corner bar option which is also nice and great for caves with limited space. This bar type also has room for comfortable seating and still enough space to store your alcohol and mix cocktails. Finally, there are combination bars which serve more than one purpose. For example a bar can double as a gaming table, like this Coaster All in One Bar Unit and Game Table. It easily converts into a gaming table featuring Roulette, Blackjack and Craps. 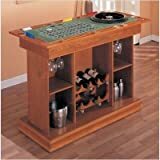 The table comes in a choice of two colors dark cherry or a lighter oak finish and provides wine shelves, hangers for glasses and plenty of space for all your bar related items. Not only will you need to decide the shape of your bar to choose from to fit your needs but you will also have to choose a material and lighting display. If you decide to go with a dry bar, that means that the bar itself does not include a sink with running water. The other choice is having the bro bar built in a way which offers the amenities of a real bar. The built-in bar can have plumbing hooked up to the sink for washing glasses or for whatever you may need. A built-in bar can also include refrigeration for a small keg or to chill your ice and glassware and also some built in electrical outlets. For the material of the bar, a popular make is wood which is very classy, durable, and makes an excellent option. However, there are also metal hardware finishes to choose from as well. Some metal finishes may have glass panels which can show off your favorite bottles and look great in any setting. Lighting and display shelves are another option to choose and the lighted display shelves can really make your bar stand out from the rest. Special lighting above the bar and around it adds life and excitement, making it feel like more than just a bar. Amazon.com and offers an extensive variety of home bars and neon lighted displays to choose from. Once you choose the design and make of your bar, all you need to do is set it up! Make sure that the bar is set up in a comfortable area of the man cave with plenty of space to be able to view the big screen. You want your guests to be able to have a drink, sit comfortably, and watch the big game without having to turn their neck or face the wrong direction. If your man cave goes by a particular theme, then you should incorporate that theme into your man cave bar. Place napkins that represent your theme’s colors on top of the bar counter and set out some snacks on the counter in bowls that compliment your theme or room colors. If you decided to go with some cool neon light displays, now is the time to set those up as well. Before you stock any liquor, make sure all of your glassware is clean, stocked, and ready to go. The glassware you will need are pints, old fashioned glasses, shot glasses, wine glasses, highball glasses, rocks glasses, martini glasses, margarita glasses, and some beer mugs. There are many more glasses to stock your man cave bar with but these are the most necessary.